Discussion in 'Announcements' started by Kureen, Nov 7, 2018. And here he does it again! Kureen suprises us with his amazing updates! Nice update, especially now that we can technically get a weekly seasonal key. I don't see the use of the auction NPC at spawn if its as easy as just doing /ah at home, one or the other has to go. Auction could definitely be improved upon, maybe /ah should be removed and just have the auction NPC at spawn, so it is at least another reason for players to go to spawn. I know a lot of people may not like that idea so maybe as a compromise have it where you can only put items for sale when you go to the auction NPC at spawn but still allow people to buy wherever they are? Maybe vice versa? I don't know, just throwing ideas out there. To be honest we just added it there to replace Big Joe since he was broken but it might also teach new players that ah exists by having it there. We thought about making ah available only through the NPC but it would just be annoying to have to warp to it just to check it out. Making it so you could only sell at the npc could be cool but I dont think that would work. 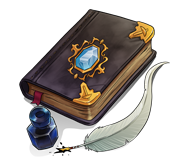 Maybe add a written book to the starter kit that shows all the useful commands that new players should know?